But don't you think that sometimes, especially in colder weather, it's nice to have something warming and hearty? Cottage pie (aka shepherd's pie, but I wanted to get rid if the animal connotations) is one such seasonally comforting dish. It's origin goes back to 18th Century England, when pies lined and topped with potato (yes, they actually had a potato lining as well as topping in those days!) were cheaper than wheat pastry pies. 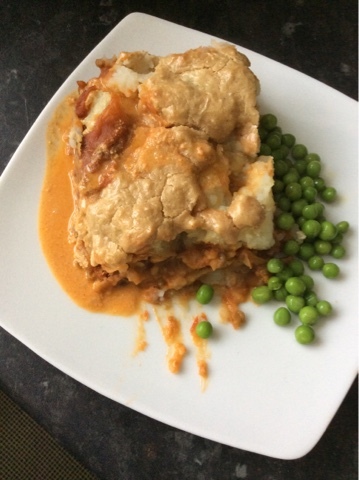 Of course, as well as potatoes and vegetables the pie traditionally contains leftover meat so in our vegan version we have substituted whole green mung beans. As a nod to the more recent custom of topping the mashed potato layer with grated cheese, we have also topped our pie with home made vegan cheeze; the same sort we often use to top pizzas. 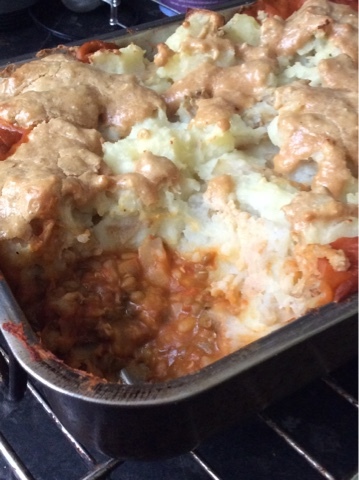 What's nice about cottage pie is the distinct layers, each with their own taste and texture. Here, a satisfyingly savoury base layer is topped by fluffy mashed potato which has been allowed to go slightly crispy on top in the oven. Next your tastebuds come across the tanginess of the vegan cheeze, and the savoury flavours of the mung bean filling... pure comfort food, we think! Cook the beans and water in a pressure cooker until the beans have absorbed the water and are soft but still intact. (Should be a mince-like texture). Meanwhile, cook the potatoes in a minimal amount of water, so that all the water is absorbed when they are cooked. This way, most of the vitamins are retained. Next, mash the potatoes with the salt and olive oil and set aside. Tip: If you have a food processor, use this instead of a potato masher. The mash will be completely smooth, although somewhat sticky, and it goes beautifully crispy on top when cooked. Set aside. Saute the white cabbage with the hing and soy sauce. Add the salt, paprika, black pepper, tomatoes and rosemary. Add the cooked mung beans. Finally, mix the ground nuts/ seeds with the tahini, miso, salt, water and lemon juice. You should get a thick paste that tastes a lot like mature Cheddar cheese. Feel free to play around with the proportions of salt, miso, lemon and water until you come up with a flavour you really love. To assemble the pie, put the filling into a rectangular/ oval oven proof dish, top with the mash and dot generously with the cheeze. Bake for about 20 minutes in the centre of an oven preheated to 200C. I usually serve this with gravy, peas and roast pumpkin. Any kind of steamed green veg is good, however. I had a little mash and some cheeze left over. 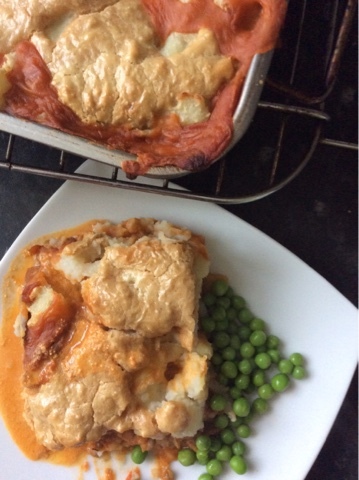 These made a yummy "cheese and potato pie" for lunch the next day. Of course, mung beans aren't the only filling; I have also made this pie with quinoa, carrots and red kidney beans with some chilli flakes to give it a kick. Sort of a red dragon pie. That was probably even more delicious than the mung bean version.